The Georgia Solar Energy Association (GA Solar) supports the development of a robust solar industry in Georgia through advocacy, education and outreach. Since GA Solar was founded in 2002, the organization has established a variety of programs and initiatives that support solar investment throughout the state. Become a GA Solar Member! Sign Up For A Complimentary Non-Member Account To Receive Our Newsletter! 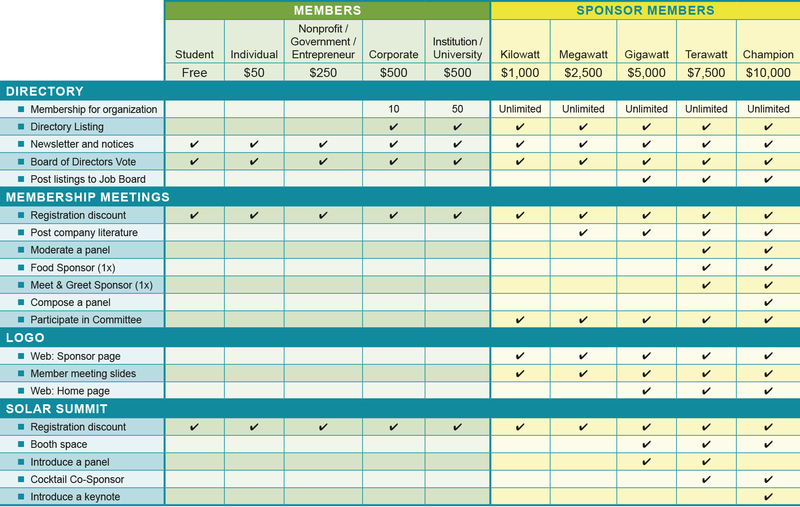 To view a PDF detailing the benefits of membership and sponsorship levels, please click here. We depend on membership and sponsorship contributions to make our work possible. Working with other advocates and the City of Atlanta to create an expedited solar permitting process. Hosted the second-largest Women in Solar Energy event in the nation in the first Georgia celebration of opportunities for women in the solar industry. Established the Southern Solar Summit, now in its eighth year, as the premiere regional showcase for solar industry information and policy. Created an eNewsletter that gives regular updates on solar news and trends to recipients in all 159 Georgia counties. Offers daily updates on solar news from around the nation on Facebook (@georgiasolar) and Twitter (@GASolar). Serves as the go-to resource for media on the solar perspective in Georgia, and provides policy information and updates to members and sponsors. In addition to the Southern Solar Summit, GA Solar annually hosts the Women in Solar Energy (WISE) event (February), the Solar Swings Golf Outing (April) and our popular holiday event (December) where we present the Solar Advocate Award. GA Solar also hosts quarterly member meetings and mixers that help members and sponsors stay connected and informed about latest solar trends and developments. We appreciate our sponsors and supporters. Their contributions make our work possible and support the growth of Georgia’s solar industry. The Georgia Solar Energy Association is a 501(c)(3) not-for-profit organization and your support is tax deductible to the extent allowed under the law.